The world’s most expensive burger has gone on sale in a Tokyo restaurant with a $1000 price tag. Chef Patrick Shimada, who works at the Oak Door steakhouse in Tokyo’s Roppongi district, is the man behind the creation – which will be on the menu until June. 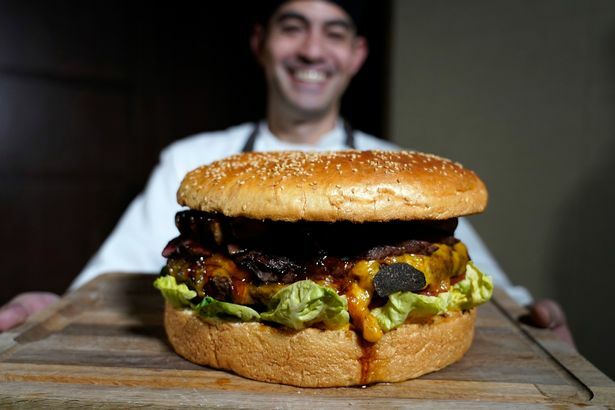 The Golden Giant Burger is made up of a 1kg patty, Wagyu beef slices, foie gras (a luxury paste made from duck of goose liver), shaved truffle, lettuce, cheddar cheese, tomatoes and onions. The huge bun, which is six inches wide and 10 tall, is dusted with gold. It has been created to celebrate the crowning of the new Japanese emperor, Crown Prince Naruhito.